IN THE WILD: The Oscars origins stem from South America and the waters of the Amazon and surrounding basins. Oscars are native to Brazil, French Guinea, Columbia, and Peru and occur frequently in the Amazon River and surrounding basins. They grown in nature to lengths of over 17 inches long and eat a stable diet of small terrestrial insects, smaller fish and crustaceans. They inhabit slower moving white water habitats that provide cover with fallen branches or debris. Populations have developed in Australia, China, and Florida. These are not native species but introduced. The Oscar has not flourished in other parts of the world because of it’s need for warmer waters (above 56 degrees F). 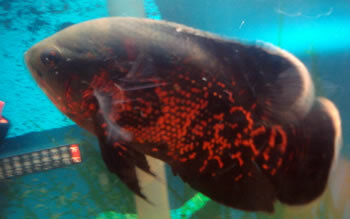 Most Oscars in natural environments are black with orange developed lines along their bodies. It is believed the reasoning for this is to prevent fin nipping from Piranha, which also inhabit the warm waters of the Amazon. Oscars are used as a food source in many countries but due to their slower growth rates are not an agricultural staple for these countries. IN AN AQUARIUM: Oscars in aquariums that support their full growth generally range from 12-14 inches once fully developed. No two Oscars are the same. Their behavioral patterns can not be predetermined by research as Oscars are very opportunistic eaters and a very intelligent species of fish. Oscars are kept by many aquarists because they are seen as a very intelligent and outgoing species of cichlid. They are as aggressive as other large South Americans that are found in nature with them. Oscars can differentiate between their owners and others and are often docile enough to be petted after feeding. Play for Oscars includes moving rocks or plants around the aquarium. Oscars should be kept at a temperature range of 72-80 degrees F, with ideal temperature at 77 degrees F. They like their water slightly softer than most and prefer an ideal ph range of 6.8 – 7.6 with ideal being 7.2. Oscars are very messy eaters and therefore need exceptional filtration in their tanks. It is recommended for a pair of Oscars to filter four times the normal capacity of the tank to keep levels in the tank normal. Furthermore, because Oscars are messy they need weekly water changes of 20-30% and vacuuming of their substrate. Oscars prefer their tanks to 50-70% hiding places and structures breaking line of sight will control aggression in the tank. Oscars can be kept with other Oscars or South Americans such as Jack Dempsey’s, Texas Cichlids, Pacu, or even silver dollars. It is recommended for a single Oscar to have no less than 55 gallons, for a pair 75 gallons or more are needed. When breeding Oscars become very territorial and other species should be removed if possible. Oscars will often perform a courtship where they will lip lock for hours at a time, if during this time one backs down, they are usually attacked. Also occasionally during mating the males will kill the females. Breeding Oscars is easily achieved once paired. Oscars mature after 1 year of age and can continue to breed for the remainder of their life. Normal life spans for Oscars in an aquarium setting with good water quality and proper nutrition is 7-8 years. An Oscars diet should consist of many a good stabled high nutritional pellet like Hikari Bio-Gold or NLS formula. Oscars diets are also supplemented with krill, freeze dried shrimp, bloodworms, or vegetables like peas, lettuce, cucumber, zucchini. Oscars are amazing fish to keep if you keep them correctly. Hopefully this post will help you better understand the Oscars needs and origins……..